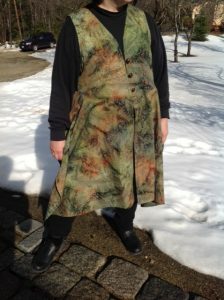 I started my first Lenox dress the day the pattern was released. I instantly fell in love with the waist definition and the lovely verticality of the front and back skirt pleats. The short sleeves were perfect for summertime while still offering coverage. The pockets were hidden yet functional. What was not to love? I am a short pear shaped woman, with C cup bust, 44 inch waist, and 54 inch hips. For my first attempt, I drafted a size 16 C cup top, onto a size 24 bottom. The sleeves were modified to be a bit longer and were a size 20 in front, and size 28 in back, to accommodate my large upper arms. It was a bit challenging, to alter the pattern without distorting the wonderful silhouette, but I got there, by distributing the added fullness throughout the bottom of the top pieces. I chose a directional mid weight cotton print for my first dress. Very soon, I was slipping into my first Lenox dress. Looking in the mirror it was love at first sight. I had found a way to show off my waist. Then, I sat down, and the love faded away. The waist was tight, and the buttons were strained. Not something I could wear out to dinner. I tried to think if I needed a standing only dress, and sadly the answer was no. 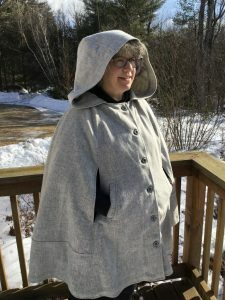 Undaunted, I quickly started on my second Lenox dress. This time I chose a mid weight linen. I measured my seated waist which was 3 inches larger, and re-drafted the pattern to accommodate the extra waist needed when seated. This resulted in a much more comfortable dress when seated, but the dress lost the lovely form fitting look when standing. Discouraged, but not beaten, I was stumped until a gift certificate to my local fabric store arrived from my darling son. While shopping I came across a lightweight denim, with a bit of stretch, which soon became my third Lenox dress. To maintain some stretch in the waistband I used an interfacing made for stretch fabrics. I went back to my original drafted pattern, and success! The third dress had the tailored fit, and the stretch added the ease needed when seated. A few cautionary notes regarding the process follow. The first time cutting out the dress I unwisely ignored the cutting layout suggestions which resulted in me needing additional yardage to accommodate the long front button bands. Despite the detailed description in the pattern I sewed the button bands on backwards the first time. Using directional fabric, I also accidentally sewed the one of the arm bands on upside down. All these were easily fixed with a stitch ripper and some time. I added both length and girth to my sleeve as my upper arms required it. 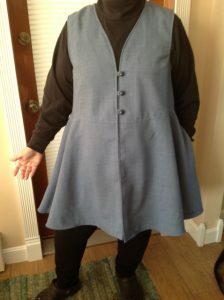 I added additional buttons as well, as I like the look, and being pear shaped, I do not need to undo the buttons, as the dress easily slips on and off over the head. I really love my Lenox dress. It helped me find my waistline, and it makes me feel absolutely wonderful while wearing it. 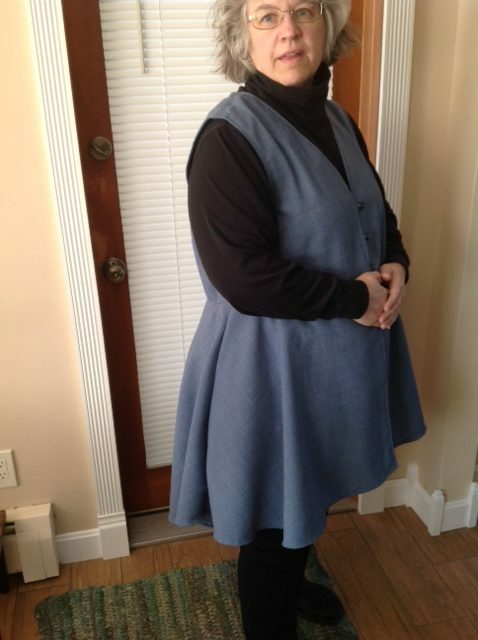 I highly recommend Cashmerette’s Lenox dress pattern. I spotted a sewn sample of Butterick 6466 pattern at Sew Expo in Puyallup, Washington, at Coni Crawford’s booth. It was love at first sight. Coni Crawford herself, measured my high bust and suggested that I fell into XL size. Even with my 43 high bust, C cup, 45 waist, and 54 hips, I thought she was crazy. Even more crazy, I bought the pattern on the spot for $12. This pattern appealed to me, because I live in turtlenecks and leggings most days. I hate being seen in that outfit, so every time I answer the door or head out for errands, I change. 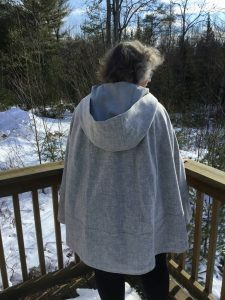 I had long dreamed of a cover up that could be kept handy for quick changes. This vest seemed the perfect all season answer. I did a muslin of the upper top in 1X. The arm holes were too small, so I carved out the 3X arms, from the 1X top. I then, cut and sewed up a test garment in a wool and synthetic blend fabric. It was soft gray blue. It did not hold a press, which I thought would make it wrinkle resistant which is what I was looking for. It was on the thicker range of the suggested fabrics. There are two views to this pattern. View A is described as circle skirt vest with pockets. View B has a more modern trendy shaping to the sides, with no pockets. I chose to start with View A, as it seemed less likely to fall out of fashion, and I love pockets. The pattern also called for a snap closure, which I replaced with three buttons, and button loops. I felt this would keep the upper vest in place. I liked my first version of the vest, except for the bottom hem, which was undulating. There was 3.75 inch dip at side seams from the center front and center back hems. 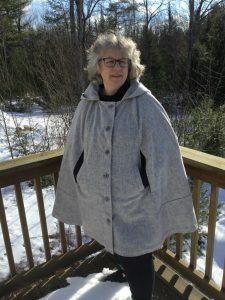 I am fussy about hems, and that seemed bizarre to me. I measured. Checked my work, and found that the pattern indeed, had a difference from center to side seams. The top of vest, had a slightly undulating bottom shape, which I thought would partner with the skirt to make the final bottom hem more consistent, but alas it was not to be. I ended up leveling out the front hem, and allowing the back hem to dip down. This resulted in an attractive enough look, but it left the front of the cover up vest, not covering up as much as I had hoped. The hips area has an incredible amount of ease, which easily accommodated my 2X/3X hips, even though the skirt was cut at 1X. 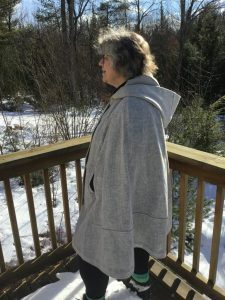 I did email Coni’s Crawford website, and asked about the hem. I got a very nice if not puzzling response back. She said to make sure to measure the full bust when selecting a size, and that View A was a circular skirt which could fall out like that depending on fabric used. She also said they had liked View B much better. I did too, as that was what I had seen a sample of at the Sew Expo. I suspected that my adjustments to the armhole of the pattern top may have inadvertently effected the pairing of top and bottom, causing the bottom hem to be distorted. 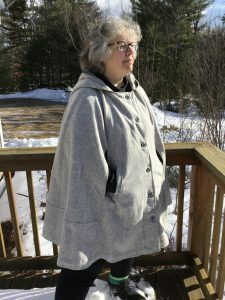 I decided to make View B, but not to alter that pattern, so I made up a straight size 1X with the only alteration being, the enlarging of arm holes. I choose a cotton batik fabric. The results were very nice. I loved the hem of View B. I do miss the pockets. I like the longer length. Again the bottom was a 1X and it easily accommodates my 2X/3X hips. Several cautionary notes: The some of pattern pieces are labeled 1, 1A, 2, 2A. The A pieces are for View B. That tripped me up. Also there is an error on step 13 of View B. You do not sew past the circle at the pivot point on side hem. I again exchanged emails with Coni Crawford who confirmed this. This pattern does add a bit of bulk at hips, which I normally avoid, but in this case, it added ease and shaping. 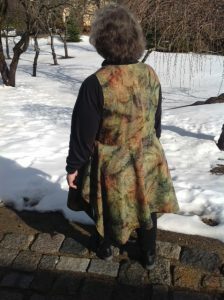 Overall the pattern is fairly easy, and I was able to make myself the garment that had caught my eye.